North America is home to over 4,000 native bee species, and one non-native, well-known European Honey Bee. You may have heard about declines in Honey Bee winter survival rates, but did you know that our native bees are also in trouble? In many study areas the variety of bee species and number of bees has decreased. 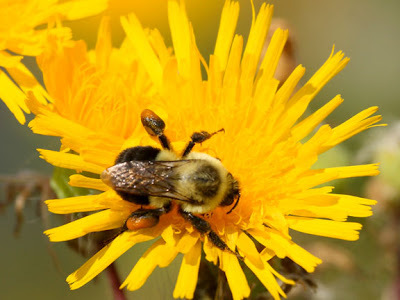 The Rusty Patched Bumble Bee population has declined by 87%. The Franklin’s Bumble Bee hasn’t been seen since 2003. Native bees pollinate 80% of the top 100 crops globally. Plants and pollinators develop intricate symbiotic relationships, often resulting in specific pollinators being the only creatures to be able to pollinate a specific plant. If the pollinator goes extinct, so does the plant. Causes of bee declines include habitat loss, nest parasites, diseases spread from commercial bees, and chemicals. Provide lots of bee food in the form of native plants with a wide variety that bloom throughout the year. Protect bee nesting habitat by installing artificial bee boxes, leaving bare soil for ground nesting bees and leaving dead snags for tunnel nesting bees. Use fewer chemicals of all types (pesticides, herbicides, rodenticides, etc). All these chemicals are, to some degree, toxic to plants, animals and our ecosystem. The suffix “–cide” means “to kill”. One last note word of advice. This spring as you clean out the leaf litter in your garden, pay special attention to those residents who might have overwintered safely under the leaves. Queen Bumble Bees are the only Bumble Bees which overwinter. These matriarchs emerge from their shelter in the spring to buzz off and start a new colony. Early season gardeners may be surprised by the large, loud, buzzing bee but simply move to another area of the garden and leave that section until a little later in the season. A Queen needs her beauty rest after all. Peregrine Falcons Have you seen a Wild Ginger flower?